Remember a week ago, we presented you the first tablet that can run both on Windows and Android, Samsung’s ATIV Q tablet. Back then Samsung didn’t give any launch availability dates or price for the powerful tablet. A German retailer has already placed the tablet for pre-ordering at a price of €1599. This does seem a little inflated, in US dollars being around $2100. We were thinking of a US release price of $1599. The German retailer announces a July 8 release of the device. We’ll see if the numbers are real, as it seems too soon to be officially released. If you think the price is too big, maybe you’re right. The same price in US dollars though seems acceptable. 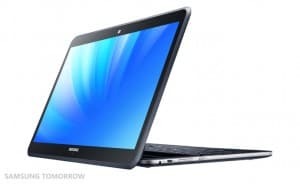 The ATIV Q is not just a tablet, it’s actually a fully functional laptop with Android integration. The resolution of the display is enormous, at 3200 x 1800 on a 13.3 inched screen. The ATIV Q crushed the competition in benchmark tests scoring almost double than the second best result. That’s what you get from a 1.6 GHz quad core Intel i5 4500 U CPU. Not only that, the hybrid device also comes with an S Pen functionality from Samsung, which really adds to its value. If you think you can afford paying this price, Samsung ATIV Q might really be a breakthrough device.